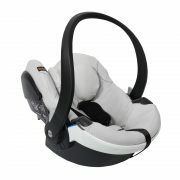 BESAFE iZi Go Modular i-Size is an innovative child seat system. One Isofix base can be used with two seats, so when your baby grows out from the baby seat, you can use the same Isofix base with the next safety seat. The Isofix base can be extended, so the seat provides more legroom for the child. This means that your child can travel rear-facing up to 4 years old. Installing the seat is very quick and easy, all you have to do is to click the seat and go. I hope you liked this review and if you have any question about the BESAFE iZi Go Modular i-Size seat or want to leave your own personal experience, leave a comment below.